There he was. A man tenderly leaning over a woman. His left hand cradling her nape, the right raising her face for a kiss. I noticed the curly mop on his head, his bare neck and the loose, flowing outfit. She looked resplendent in gold, her eyes closed, her lips red, her eyebrows arched. Yellow flowers were dangling from her ankle and blue/black flowers tidily arranged in her brown hair. At Vienna’s airport, while the crowd scurried and scrambled for bags, I stood by a column and gazed at the man and the woman. I knew not their name, but the kiss was so surreal in its magnificence that I stood there. And stared. Gaped. Ogled. There he was. A man tenderly leaning over a woman. His left hand cradling her nape, the right raising her face for a kiss. I noticed the curly mop on his head, his bare neck and the loose, flowing outfit. She looked resplendent in gold, her eyes closed, her lips red, her eyebrows arched. Yellow flowers were dangling from her ankle and blue/black flowers tidily arranged in her brown hair. At Vienna’s airport, while the crowd scurried and scrambled for bags, I stood by a column and gazed at the man and the woman. I knew not their name, but the kiss was so surreal in its magnificence that I stood there. And stared. Gaped. Ogled. It is the month of love and I was gawking at a frame in which the man and the woman stood. I was staring at the world’s most known kiss, The Kiss, the best-known painting by Viennese artist Gustav Klimt. A painting so seductively gentle that it sanctifies an ordinary kiss into piety. At the airport hung a print. I picked up my bags and hurried to see the original in Belvedere Palace. 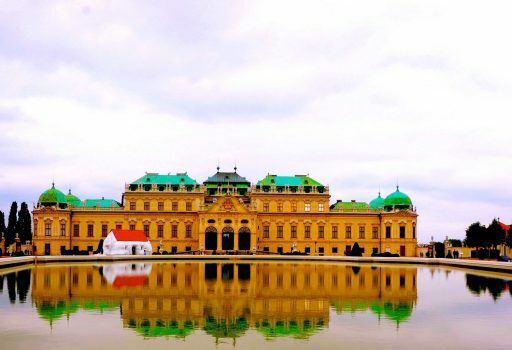 Built in the 18th century as the summer residence of Prince Eugene of Savoy, it houses the world’s largest collection of Klimt’s paintings. The crowd was milling in the Palace. Landscapes and people hung painted within gilded frames, but all I was looking for was The Kiss. I saw the man, the woman and the kiss. Again. I stared. Again. 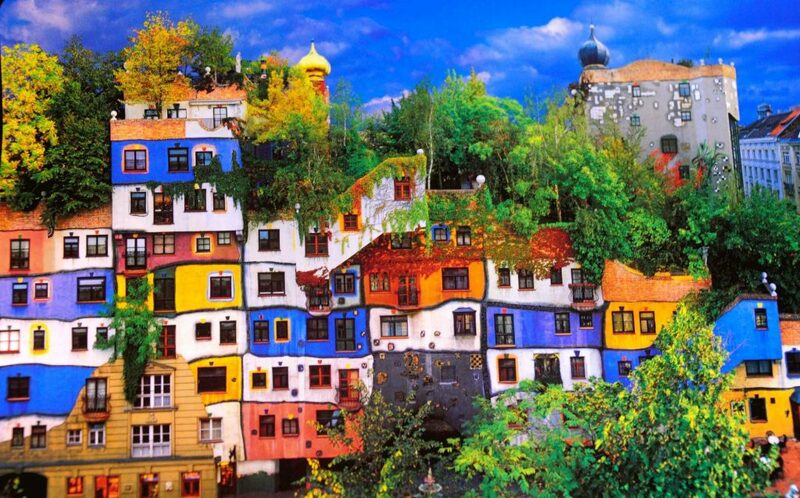 In Vienna, I could go wherever Klimt went. But I wanted Ludwig van Beethoven’s company. I knew where to find him. In the fourth floor of Pasqualatihaus, where he lived for eight years and worked on his 4th, 5th, 7th and 8th symphonies, and, above all, on Fidelio, an opera. I cannot string the D minor with an F major on the keyboard, but I could count like him. Eins. Zwei. Drei. Vier. Fünf… Sechzig. One. Two. Three. Four. Five… Sixty. Every morning Beethoven counted 60 beans for his coffee – he thought 60 beans provided the best taste. In 2018, international consulting firm Mercer named Vienna the most liveable city in the world for the ninth time in a row. 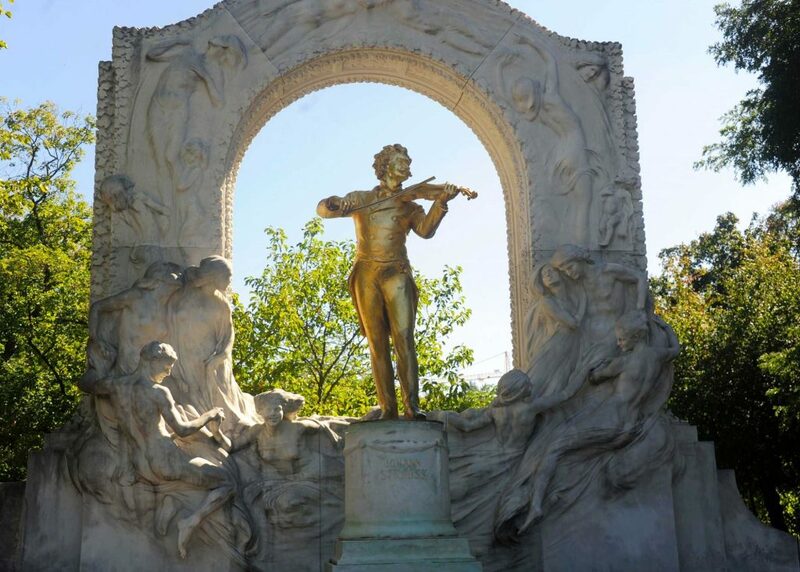 Beethoven’s music still hangs in the Viennese air, but it is Mozart who is everywhere. Men dressed as Mozart selling tickets outside the Opera House, a Mozart look-alike busker on the street, a torte named Mozart, a Mozart cut-out with a box of chocolates bearing his name. Impersonators and fakes are many, but the real Mozart lies buried in St Marx Cemetery, his tombstone adorned with a stone column and an angel. Beethoven’s music still hangs in the Viennese air, but it is Mozart who is everywhere. Men dressed as Mozart selling tickets outside the Opera House, a Mozart look-alike busker on the street, a torte named Mozart, a Mozart cut-out with a box of chocolates bearing his name. Impersonators and fakes are many, but the real Mozart lies buried in St Marx Cemetery, his tombstone adorned with a stone column and an angel. With Klimt, Mozart and Beethoven for company in the city that has been listed as the world’s most ‘liveable’, I needed coffee to wash down the facts. Franziskaner. Verkehrt. Verlangerter Schwarzer. Kauziner. Einspanner. Such tongue-twisting coffee names! But in Vienna, coffee is not merely a beverage. It is a state of mind. A way of life. Proudly sitting in UNESCO’s Intangible Cultural Heritage list. Many poets and writers have rhapsodised about the tradition, but no one said it better than noted essayist Alfred Polgar. 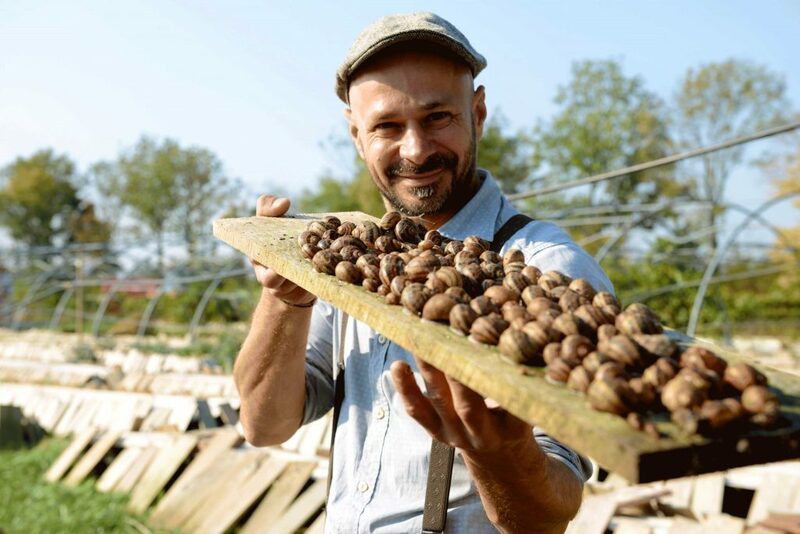 Snail meal: Andreas Gugumuck, Austria’s only snail farmer with 300,000 snails growing in his farm, serves a seven-course snail meal. He has created a snail think-tank. Yes, a snail think-tank. Chew on that! Mushroom in coffee grounds: Florian Hofer and Manuel Bornbaum, two students of agriculture, emptied their pockets, rented a basement and decided to grow oyster mushrooms in black polybags.The soil: used coffee grounds. Old-fashioned Vinegar Brewery: Erwin Gegenbauer is called the Willy Wonka of Vinegar. He makes 70 sorts of vinegar and myriad varieties of oil, coffee and juices. All the old-fashioned way. Chef Heinz Reitbauer: Steirereck, his restaurant, has two Michelin stars, four Gault-Milau toques and ranks 10th in the World’s Best Restaurants list. Dinner in a Ferris Wheel: A candlelight dinner for two is offered by the Romantic Crystal Dinner in Vienna’s Giant Ferris Wheel. Picnic baskets: Order a picnic basket from restaurant La Crêperie or Villa Aurora on Wilhelminenberg and go on a boat ride on the Old Danube. The most atmospheric are the full moon rides with a glass of Prosecco. In Cafe Landtmann, coffee could have been a Freudian slip. There’s a corner table that Sigmund Freud invariably occupied sipping his coffee and blowing swirls of cigarette smoke. Freud was not there. I do not know which coffee Freud, a regular, and Paul McCartney, an occasional, preferred in the Cafe. Just to not get embarrassed with horrible pronunciations, I ordered a Melange, only safe-to-pronounce coffee name. If I tell you this coffee is slightly lengthened, do not hiss. Melange is mocha lengthened with more water, offset with milk, foamed with milk topping and served in a large cup. In the month of love, what’s more in the city of palaces, museums, coffee and art? I ask Isabella Rauter of Vienna Tourist Board. ‘Winding lanes, arcade-lined courtyards, time-honoured palaces: in Vienna, the city centre is especially romantic. In the oldest quarters of the city on the Danube around St. Stephen’s Cathedral, the narrow lanes are paved with cobblestones as they were centuries ago, while a stroll along Schönlaterngasse or Domgasse becomes an encounter with the past. Romantic walks can also be found on Spittelberg, a quarter in the 7th district with beautifully preserved houses from the Biedermeier period,’ Rauter lists the romance must-dos. To this she adds the chestnut trees blossom in the Prater, 400 types of rose bloom in the Volksgarten and nearly 850 parks and green spaces (280 of them imperial) in the city. In February, Vienna is seeped in all that makes love lovely. I am back from the world’s most liveable city and a little undecided about tomorrow morning. Should I count 60 coffee beans and brew like Beethoven? Or, play the black keys of the piano like Mozart? Or, sit on a Chesterfield and decipher minds like Freud? Perhaps a better idea would be to just stare at The Kiss. Just stare.